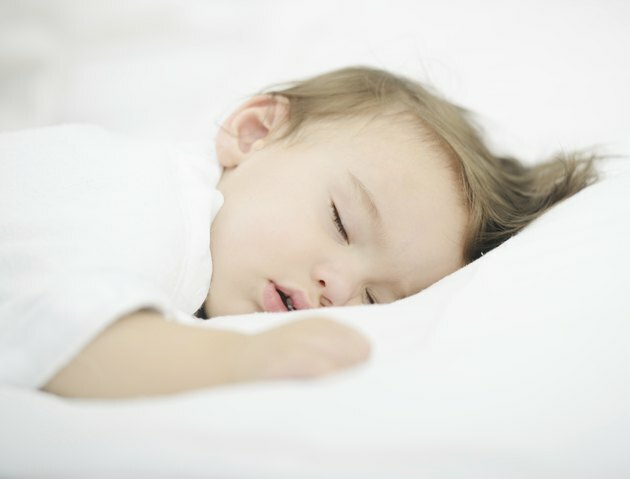 When your baby turns 10 months old, you may see some changes in her sleep patterns. Even a baby who previously slept through the night may begin waking once again, and wanting to eat throughout the night. If you're feeling impatient and exasperated about your baby's sleep habits, 10 months old is a good time to begin teaching your child good sleep habits for life. By offering comfort and training, your 10-month-old can sleep safely and soundly. Some babies go through a growth spurt around nine to 10 months of age. This growth spurt causes them to be hungry in the night, even if they were previously sleeping all night long. If your baby seems to be waking up looking for a feeding, try giving him a bottle or nurse him directly before bed, even if you've fed him recently, suggests "The Baby Sleep Site." This can help "top him off" so he isn't hungry through the night. Never rock or feed your 10-month-old to sleep and then place her in her crib. Doing this teaches her that she needs a crutch in order to go to sleep. If you continue that pattern, eventually your 10-month-old will not be able to fall asleep on her own. Instead, put her into her crib when she is drowsy, yet still awake. When she wakes in the night, she'll be more apt to fall back asleep quickly, because she doesn't need comfort or food to do so. Comfort items are an ideal way for your 10-month-old to get to sleep. At that age, your baby is able to discern between things that he prefers, so a small toy or blanket can receive elevated status. Give that item only at bedtime, so your 10-month-old is eager to get into bed and stay there with his comfort item. Comfort items promote healthy attachments, notes the U.S. Department of Health and Human Services, and can help your 10-month-old sleep on his own. When your baby is 10 months of age, you may wish to try "sleep training" with her. Sleep training is a method of teaching your baby to sleep by limiting your time with her so that she maintains more predictable sleeping patterns and learns to comfort herself and sleep by herself. Some sleep training methods include the Richard Ferber method, detailed in his book "Solve Your Child's Sleep Problems," and the Elizabeth Pantley version of training, detailed in "The No-Cry Sleep Solution." Choose the training method that most closely mirrors your own parenting philosophies. If your 10-month-old isn't sleeping well and nothing seems to help, sleep regression may be to blame. A growth spurt, teething or even learning new skills can keep him feeling restless at night, resulting in a less-than-great night's sleep for everyone else. Dr. William Sears, associate clinical professor of pediatrics at the University of California, Irvine, School of Medicine notes that it is a temporary condition, and most parents who choose to ride it out find that their babies return to better sleep patterns within a month or two. Is Melatonin Safe to Take While Breastfeeding?